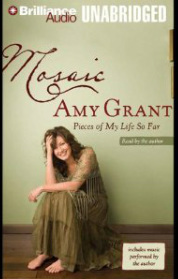 “Mosaic” is a book by Amy Grant which I read this past year. This past Saturday morning, I sat in my coffee shop with my niece’s two sons, Adam and Evan, ages 21 and 19, along with one of their girlfriends. I was confronted with the same question that Amy Grant often asked herself. My brother, the grandfather of these two boys, died at age 35, when I was 25; they have never seen him. I found myself referencing the fact that their grandfather was buried on their mother’s fifth birthday. How does one find words to give another a picture of what took place in another time. To describe what he was like? Hard. As time passes, I find myself reaching for “black.” I want them to fully know, understand in some way, even feel a bit of what once was that they never got to see or experience. I wanted them to see the full and complete picture of that loved one, that friend; otherwise, it is just bits and pieces, fragments. I think you can see my point. “I wanted especially those two boys to see him (my brother, their mother’s father and their grandfather) in the light and times I did.” I wanted to find that artist’s palette and pull out the color black. But it is not easy to do. So badly we need that favorite color to give depth to what we hope will be understood. Some years ago when I was teaching and coaching in central Indiana, on occasion I would attend a basketball game at a high school in Kokomo, Indiana. 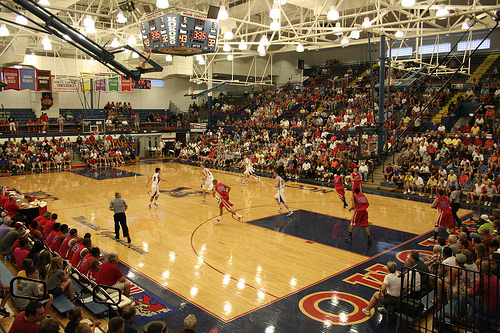 The Memorial Gymnasium at Kokomo High School is the home of the WildKats. The gym was built in the late 1940s’ and would seat over 7,000 people. This gym was special, different than any other gymnasium I had ever been in (and I’ve been in hundreds of them). On one of my trips to Europe I visited a military cemetery. As I was leaving the cemetery I read the following on a sign that was posted near the exit. As I said it was like no other place I have ever been to see a basketball game. It’s interesting that this community chose to remember what the cost was for people to go about living and enjoying life. They recognized that freedom is costly. Well, this past week was the first week of school for the little folks out at Hillsboro Elementary school, in Leiper’s Fork, Tennessee. 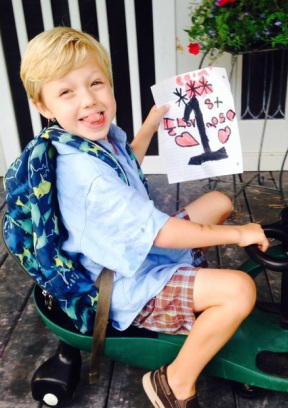 These were some hard days for our young first grade grandson, Jake. This past Friday it seems that Jake got “clipped down.” For those of you who don’t know what that means, it means there was some “behavior infractions” during his day. They have a clipboard with a line, and if you have a good day you get “clipped up” over the line, and if your day is not so good, you get “clipped down” below the line. When his grandmother picked him up from school this past Friday the word, upon getting in the car, was the clip had gone in the wrong direction. Monday, the beginning of a new week for Jake would not see all blue skies and rainbows for him. Normally his mother will make Jake’s and his sister’s lunch. This past week-end their mom and dad had a week-end get away and grandmother stayed with the kids. To make things easier on grandma (MiMi) the kids would buy their lunches at school on Monday. I am not sure if Jake had ever bought his lunch or been in the lunch line enough times to understand the process. Apparently he was so excited when he saw all the food laid out before him cafeteria style, so hey, he went for it! Jake had gathered for himself a rather large supply of goodies, you know, like cookies, chocolate milk, pudding, all those things that appear good to a first grader. He had gathered up just about everything that came within eye site. Arms now full he reaches the end of the line where the cashier was. “What’s that?” He thought, “Isn’t this a free food line? The cashier lady told him she didn’t think his mother would want him to have all that “junk” food and he would have to return some of it. A bit later he gets back in line and asked the cashier lady “Can I have some ice cream?” His mother lets the kids have ice cream only on Friday, and the cashier lady has a note making her aware of this arrangement. Well, bad news again for Jake boy. Wouldn’t you know it, there’s that same lady telling him that his mother wouldn’t want him having ice cream today, only on Fridays. Later, the cashier lady called Jake’s mother and told her, “I didn’t have the heart to tell him he couldn’t have chips.” I hope this new week will be better for the little fella. They sure can make life hard for a guy just trying to get along in this world and eat properly. You ever had a couple days like that? Someone telling you what you can and can’t have and then, on top of that, they tell you… no ice cream. He gave her a gentle lecture. Recently I finished reading a chick book. “The Girls from Ames.” It has been described as a story of women and a forty-year friendship. It is a story of eleven childhood friends who formed a special bond while growing up in Ames, Iowa. These eleven girls all graduated from the same high school in 1981 and have continued that friendship still to this day. The book shares the deep personal moments and insights of each of these girls from those days, some even pre high school till the present time. One of the girls tells the story of a time in her life when she was in college and exhibited some “bad judgment.” (Oh how novel, college and bad judgment.) The experience caused her to go to her dad. Her dad also happened to be one of the town doctors in that community of 50,000. What struck me was how she described what happened. What she shared with him was very difficult for her. In her words she said, “He gave me a gentle lecture.” She never forgot the lecture but also importantly she never forgot the manner in which it was given. The famous poet Emily Dickinson penned a poem that carries the idea that how one is approached will have a bearing on how the “lecture” will be received and remembered. Where is the Strangest Place You’ve Cried? Where is the strangest place you have cried? Frankie Valli and the Four Seasons might have once sung, “Big Girls Don’t Cry,” but I don’t buy that. Big girls, and big boys for that matter, do cry. Last night I cried and in of all places a honky tonky. Now I don’t mean a breakdown, two boxes of Kleenex, get control of yourself, type cry. But yes, I cried. Many Monday nights find me at a place here in Nashville called the Station Inn. On Monday nights Carl Jackson and his group play. Most of you are not familiar with Jackson but he is a most talented musician. For twelve years he was Glen Campbell’s musical director. Pretty strong credentials one would have to say. He and his group are very gifted. Many evenings Campbell’s young daughter Ashley will come by and sit in with the band for a few numbers. One of those evenings a few weeks back I sat and talked with her. What a treat. In the soundtrack of a Robert Duvall, (one of my all time favorite actors), movie, “The Apostle,” there is a song entitled, “Waitin’ On The Far Side Banks of Jordan.” I have come to love that song. I don’t know when the lyrics to a song have been more vivid for me in recent times than the lyrics to that song. The jist of the song is a loved one has passed on and is now in glory, heaven. The love and the bond between this deceased and others is so strong that while in glory they describe what they will be doing. Not only what they will be doing but how they will be looking and anticipating the coming of others. I don’t know what the belief each of you might have about life after death or the thought of eternal life. My purpose here is not to preach to anyone. But for me personally the lyrics are a beautiful thought. It so vividly presents a picture about another waiting and what they will do when they see others they love coming. Carl Jackson generally closes each of his shows with a hymn. His closing words last night acknowleded that his mother had since passed away, “Mother this song is for you, it says it all.” He closed with this song. And when I see you coming I will rise up with a shout! And come running through the shallow waters reaching for your hand. If you are a person of faith, I’ve got to think you have someone(s) you believe that, “When they see you coming, they are gonna rise up with a shout and are gonna come runnin’ and they will be reaching for your, our hand.” As I said previously the song paints a picture for me just as vivid as one that might be hanging on my office wall. I can even put names to it. You understand why one might, cry? How about you? Can you imagine someone drawing pictures in the sand, waiting and shouting when they see you and then come running and reaching for your hand? 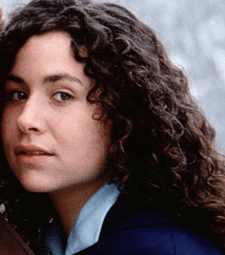 I was taken by the above line I once heard in a movie my wife and I saw, “Circle of Friends,” staring Minnie Driver. Driver plays a young college co-ed who finds herself in an unusual situation. “Benny,” her character, might be described as modest, self-conscious and not really as good looking or attractive as her circle of girlfriends. During our dating days she would be the kind of girl we would’ve described as, “Hey, she has a great personality.” Benny was not a “hottie;” yet, as is often the case, there was something very special about her. At a high school reunion I once attended I had a party say to me, “I want to apologize to you.” I was a bit surprised by that statement, “Why?” I asked. The party went on to tell me the first time they saw me they had formed an opinion, and “I came to find out you were nothing like I had first created in my mind.” I told the party no apology needed. I also had certainly done such in my time. Often it can be very premature, unfair and sometimes just wrong when we make judgments on someone’s appearance. Contact and interaction always helps in making a better evaluation of another. It might just be possible that not every rhino standing over by the water pond shading themselves with another bunch of rhinos, has as thick a skin as we think all rhinos do. I wrote the following on August 16, 2011. Tomorrow, August 16, 2014 will be thirty-seven years since his passing. 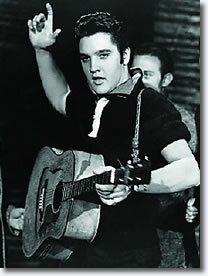 Elvis would have been 79 years old. Elvis would never/will never be old. Never. He died thirty-four years ago today. If he were living, he would be 76 years old. In the minds of a lot of us he still is. Living that is. I have a good friend whose mother was a big fan, and he often quoted what his Mom would say about Elvis, “Well first, when he sang you could understand the words, and secondly, he loved his Mama.” Guess one would have to say that is pretty credible. Kissed my first girl when I was 10 years old. One small step for the man I’m gonna be. cause it might be as close as I get. Yeah, when Elvis died many of us came to the realization about a lot of things. This how a recent conversation went the other morning at my coffee place. I just sat and listened. “Hey, I was back home this past week,” he said to one of the fellas sitting at our table this morning. The two of them had grown up together in this small town in Kentucky. This conversation continued for some time in the same vein. Both of these fellas were products of the late 50s’. I identified with much of their conversation having grown up during that time in similar surroundings. Just before one fella left he said to his friend, “I saw ____ while I was back home, ran into her at the ballgame. She has a grandson who is playing and one of her granddaughter’s is a cheerleader.” His friend’s face changed. 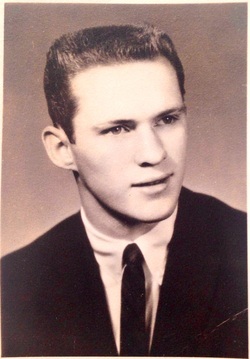 He paused a moment, looked down at his coffee and then asked his friend, “Did she mention my name, did she ask about me?” They had once been an item in high school and went steady, one of those forever couples… if you are from the 50s’ you get the picture. “Yes, yes she did ask about you,” his friend answered. I stayed a few minutes more, and then left. As I got into my car I pulled out an old Gordon Lightfoot cassette, the second song that came on pretty well described what I had just witnessed. And by the way, did she mention my name? And by the way did she mention my name? In a recent blog posting I referenced two things that were very important at one time in the life of a teenager. One was a high school letter jacket and the other a high school class ring. But I also said that with time the value of each faded. Well here is a story about a ring…a class ring…that the value has not, nor ever, will fade. Hope you enjoy. No statement could have shocked me more. Those words were said to me early one morning at the breakfast table as I was about to leave the house headed to my college classes in 1964. “What?” I said. “Yes, you go by the jewelers this evening.” “What for,” I asked. “Your dad and I would like for you to go by there and have your ring finger measured,” was my mother’s reply. “My ring finger measured? What in the world for?” The last place in the world I could imagine my mother asking me to go was to a jewelry store. Jewelry was not a big item in my family. My dad wore no jewelry, oh maybe that tie clip he wore with his Sunday tie. The only jewelry I remember my mother wearing was her simple silver wedding band and on occasion some ear rings. “With your college graduation coming up, your dad and I thought you might like to have a college ring,” my mother said to me. “Ok.” was my reply, and later that day I stopped at Ross Jewelers and had my ring finger measured. About four weeks later a ring arrived. But the real story I learned much later. Years later. The ring cost around seventy-five dollars, not a big sum by today’s standards, but not so in 1964 and on my parent’s budget. Later I was to learn they paid ten dollars and then made monthly payments on the ring for the next six or seven months until it was paid off. My folks did not have a lot of extra money, and believe you me, a ring was an “extra” item. But to them graduating from college was not just another happening. It was special. I was the first Adamson in ages to graduate college, and they were very happy and proud of and for me. Today that ring sits in one of two places: either on my bedroom night stand or on my desk in my office. Often it is the first thing I see every morning or the last thing I see at night as I leave my home office. It is a reminder to me of two people who loved and cared deeply about their child, and on this occasion they were going to break open the “alabaster” jar. Early one recent morning as I sat outside my coffee place a young man drove up in a pick up truck. As he got out and started walking toward the shop I noticed he had on his high school letter jacket. I had to smile. Letter jacket. Oh my. I wrote something back in January of 2011 about letter jackets and there one time influence. I thought “I wonder where my old jacket ended up?” The letter on that jacket I do know and kept. The “P” for Pimento. Pimento Peppers. Ok just keep your comments to yourself. When I was in high school a letter jacket was something you received during your senior year. On that jacket would be the letter of your school and emblems of the sports in which you had lettered and the number of years you lettered in that sport. Letter jackets and class rings once carried great importance in the life of a young person. Isn’t it interesting what we are sometimes impressed with? My 50th high school reunion was in May and over the past few months I have been in contact with former various classmates now scattered throughout the U.S. There were twenty-seven of us, and of that number, I think twenty-one of us were in school together all twelve grades. I received an email from one of my classmates that I have not seen since graduating in 1960. She mentioned a guy she had a date with and commented that for the life of her, she could not figure out why she went out with him. Then she said something that struck a chord with me, and if you were in school in the late 50s’, her statement made perfect sense. “I guess I went out with him because I was impressed with his car and he had a letter jacket.” Excellent explanation; no further information needed. Letter jackets and class rings were two big items during those high school years. Letter jackets were often presented at an athletic banquet or at an all school assembly. I remember receiving mine as if it was yesterday. That letter jacket meant more to me at that time in my life than if I was honored to receive a green jacket in the Butler Cabin at Augusta. Anything Billy Payne, the Master’s Chairman, might have done would not have matched the feeling I had upon receiving my high school athletic letter jacket. To a teenage boy his letter jacket was definitely “an instrument of influence.” I might add that generally you didn’t wear your jacket more than a day or so, as it would probably be worn by some pretty little cheerleader or one’s girl friend. Sadly, like some other things from that time period that jacket lost its staying power, and certainly its power and influence would be dated. Today I wonder how many even know where their jacket is; maybe hanging in the back of one’s closet or in a box stuck in the attic, if kept at all. Sometime back my good friend and classmate, Mike Brinkman, penned a little ode about letter jackets. Fifty years have come and gone but I wonder if sometimes we still aren’t too easily influenced by things that only have a value for a short period of time and soon that value fades and passes on.